Looking back at some photos my wife Shawna took on 6-17-08 while we were in northwest Nebraska waiting for storms to develop, I ran into these shots above that we had forgotten about. We've both seen plenty of "horseshoe vortices", but never a twin pair like this, south of Alliance. Shawna has a good eye for picking them out (I would have missed these). There are probably several ways such vortices can form, but the most common idea is shown in the black and white explanation figure above. As a cumulus updraft builds, it may encounter rapid and strong vertical wind shear (differing wind speeds and/or directions within a short distance of height). 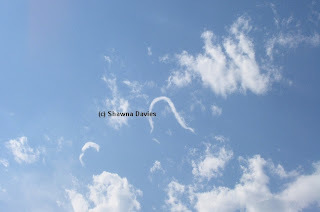 This may cause the updraft to develop horizontal spin that, when stretched further by the small updraft, spins faster and is deformed into a "horseshoe" shape. Condensation within the cloud allows us to visually see the vortex. As dry air mixes into the cloud, it evaporates, except for the spinning horseshoe vortex, which resists dry air entrainment for a little while longer. In reality, horseshoe vortex formation is complex (otherwise they would happen all the time), but the diagram above summarizes some basics. An estimated wind profile for Alliance is also shown above. Note the rapid and sharp wind shift from southeast to northwest at about 3000 ft above ground. 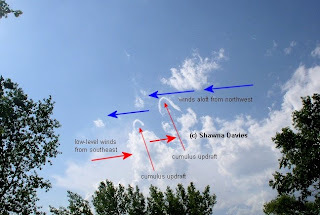 This may help explain the horizontal spin that developed and stretched into "horseshoe" shapes with condensation as these cumulus updrafts on 6-17-08 encountered this sudden wind shear with height. 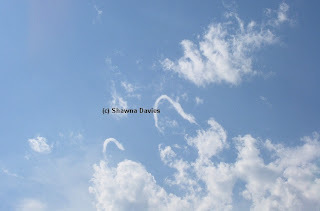 I don't think I've ever seen a photo of twin horseshoe vortices before. Thanks, Shawna, for catching these! Lead forecaster at NWS DDC and storm chaser/photographer extraordinaire Mike Umscheid documented a rare Kansas November wedge tornado, in the far southwest corner of the sunflower state yesterday. Wow! Go to: http://www.underthemeso.com/blog/ to see and read more. The setting was a cold core setup (read paper here), with a 500 mb low attempting to cut-off over eastern Colorado within a strong upper wave lifting northeast (see SPC graphics above). An area of CAPE was over southwest Kansas, just east of the surface low where boundaries intersected (a fairly classic localized setup, see surface map above). The cell Mike chased looked to be pretty close to this key boundary intersection (see radar above), with sunny skies to the south on satellite (not shown), generating a good surface heat axis pointing into the area. The RUC analysis sounding in the Johnson/Ulysses KS area at 21 UTC (see above), about 20-25 minutes before the tornado, showed good CAPE for a cold core setup (near 700 J/kg), all bunched below roughly 400 mb for a classic small supercell profile. With plenty of really cold air aloft (-10 C at 700 mb! ), dew points in the 40s F and temps in the 50s F were all that was needed. Amazing! A potential cold core setup in South Dakota last week (11/5/08) didn't pan out for tornadoes, as there appeared to be way too many low clouds for needed surface heating and instability near the boundary intersection with that system, unlike the one in southwest Kansas yesterday.